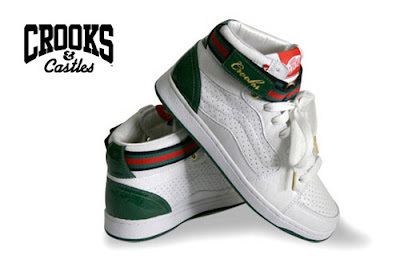 Los Angeles-based Crooks & Castles will be joining the sneaker game by collaborating with skate shoe giant Vans. Based on the Fremont High model, it will come in white and black colorways with Crooks’ red/green/black strap accents reminiscent of Gucci’s high-end design. These are scheduled to be released early spring of ’09 and will only be sold at the 8021 store.